For scientists, studying a disease presents a puzzle looking for an answer, but there are real people behind the research that may one day cure the illnesses that turned their lives upside down. Chris Lorson and Monir Shababi work on one of these puzzles in Bond LSC. Find out more about their work and the faces behind SMARD, a rare, often fatal, genetic motor neuron disease in the following story courtesy of the College of Veterinary Medicine. Monir Shababi, an assistant research professor in veterinary pathobiology, and Christian Lorson, Bond LSC principal investigator, College of Veterinary Medicine professor and associate dean for research and graduate studies, have invested countless hours during the past five years to solving a cruel medical mystery. A family who has endured the agonizing ordeal of having two children born with the same disease has invested funding for the research being conducted at MU’s Bond Life Sciences Center. 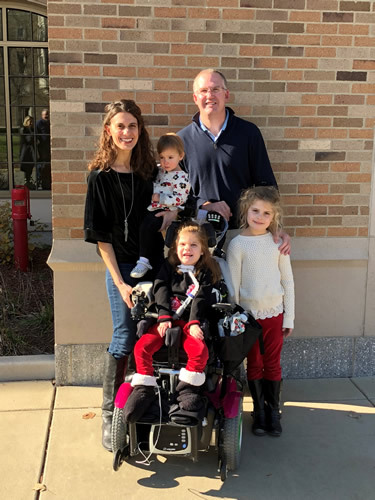 Meet the Sims family: mother, Jill Sims, MD; daughter, Caroline; father, Eric, an associate professor of economics at Notre Dame; daughter, Molly; and daughter, Catherine, who turned 5 in August. Catherine is living with a rare genetic disorder called Spinal Muscular Atrophy with Respiratory Distress, or SMARD. The Sims had another child, Bobby, who was born in 2012 and died of SMARD after a month of life. The disease is called spinal muscle atrophy with respiratory distress, or SMARD. SMARD is a progressive motor neuron disease that has no treatment or cure. At least, not yet. Shababi, PhD, and Lorson, PhD, and the Sims family — mother Jill, father Eric, grandparents Grant and Patricia — have teamed up in an effort to change that. The disease is so rare that it is largely unknown, even to most medical professionals. When you are the parent of a child with SMARD, you are in a daily, nonstop, life-and-death struggle. It is exhausting. It is frustrating. It is a battle that requires an endless reserve of endurance and willpower. And, it requires cutting-edge, scientific discoveries that are just coming to light at MU’s Bond Life Sciences Center. 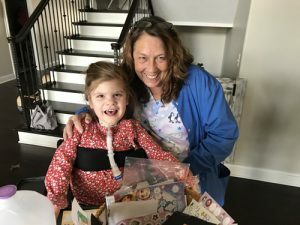 Catherine Sims lives on a ventilator and needs around-the-clock care. Yet, now age 5, her life is a victory. 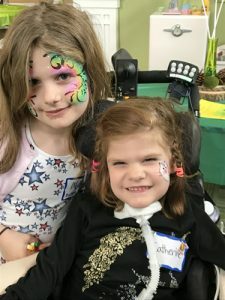 Despite requiring mechanical ventilation and around-the-clock care, Catherine attends school, enjoys family outings and participates in activities as much as possible. Bobby Sims, born Oct. 31, 2012, died on Nov. 30, 2012. His death was attributed to unknown respiratory failure, and he was considered a victim of Sudden Infant Death Syndrome (SIDS). Catherine Sims was born in August 2013; her diagnosis came four months later. “I went on to have Catherine next, and then we knew something was up,” Sims says. “Catherine was very similar to Bobby, very small and very quiet. That, of course, led us to figure out something was going on. The blog contained personal stories of families who had children with a disease named SMARD. The goal of the blog was to put SMARD on the radar, for families who didn’t have a diagnosis and needed to find answers as well as find support. Porter Werner had posted her own family’s story. “My friend forwarded me Lisa’s particular story regarding her two children with SMARD, and the story almost identically matched my own,” Sims recalls. Porter had read extensively and combed the internet for information and cases similar to those of her children. Porter eventually found a modicum of information about something called SMARD, which had been diagnosed in approximately 60 children. “Lisa Porter’s blog contained the personal stories of families who had children with SMARD,” Sims recalls. “My friend forwarded me Lisa’s particular story regarding her two children with SMARD, and the story almost identically matched my own. Living with SMARD, a progressive motor neuron disease, means Catherine needs 24/7 care from her family and home-health attendants. “The Werner’s first daughter died at six weeks of age. It was called a SIDS case; she just died in her sleep,” Sims says. 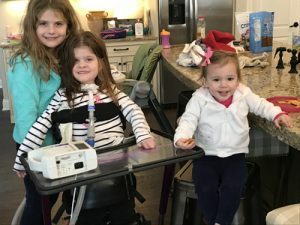 “They had Silas, their son who is living with SMARD, shortly thereafter and she put him in a sleep study when he was three weeks old. She said, ‘No, my daughter didn’t just die. There was a reason.’ It turned out that Silas was having major breathing problems during sleep. In order to know what SMARD is, it is important to know what it is not. Despite the obvious similarities in name, spinal muscular atrophy (SMA) and spinal muscular atrophy with respiratory distress have sharp differences. SMA, which can range from type 1-4, is caused by mutations in or the absence of the SMN1 gene. SMA typically causes weakness in the core first and the baby or child may present as hypotonic, or having low muscle tone — sometimes called floppy baby syndrome. Babies or children with SMA may eventually develop respiratory compromise over time. SMA is the leading genetic killer of infants; one in 40 people are carriers of SMA. SMARD, in contrast, is extremely rare. The exact number of cases is unknown, but it has clearly occurred in more than the approximately 100 children worldwide who now carry that tragic diagnosis. SMARD is branded an “orphan” disease, a term commonly applied to any debilitating medical condition that affects fewer than 200,000 Americans. There is little information and few resources available regarding SMARD. The Sims sisters: Catherine, a SMARD survivor, with older sister Molly and younger sister Caroline. Catherine is standing with the aid of a device. SMARD is a genetic disease, caused by mutations or loss of the IGHMBP2 gene, Immunoglobulin MU-binding protein 2. The condition is inherited in a recessive pattern, meaning both parents must be carriers of the gene mutation and each parent must pass along a copy of the mutation in order for the child to be affected. In essence, every time two carriers have a baby, there is a one in four chance their child will be affected. Onset of the disease usually occurs suddenly, in what seems to be an otherwise healthy baby, typically between 6 weeks and 6 months of age. Once the diaphragm is paralyzed, the infant must depend on their accessory muscles to breathe. These muscles also weaken as the disease progresses, until the child needs mechanical ventilation. Many children die in the first year of life, often in their sleep or from a respiratory illness. Past the age of 1 year, almost all children living with SMARD require a tracheostomy, a ventilator and a wheelchair. Simply put, SMA usually presents as a hypotonic or “floppy” baby who gradually develops respiratory distress. SMARD presents as a baby in respiratory distress who gradually becomes hypotonic. SMA and SMARD share a similarity in that both are monogenic disorders, conditions caused by mutations or loss of a single gene. Shababi and Lorson have an established history of working with SMA. Now, their focus is SMARD. “In 2009 and 2010, a lab at the Ohio State University used a viral vector to introduce the SMN gene in SMA mice,” Shababi, the CVM researcher, says. “The viral vector does not contain the necessary genes required for the virus to cause infectious disease. You can replace viral genes with the specific gene you want and keep only the part of the virus that is required to enter the body, find its receptor and produce the desired protein from the gene it carries. “They (researchers at Ohio State) put a human SMN gene into a viral vector — adeno-associated virus 9 (AAV9) — that has the potential to pass the blood brain barrier in humans. This virus has the capability to enter into the brain, the spinal cord, muscles and peripheral organs,” Shababi continues. “The AAV9 virus carrying the SMN gene was injected into SMA mice. They were able to rescue the affected mice. 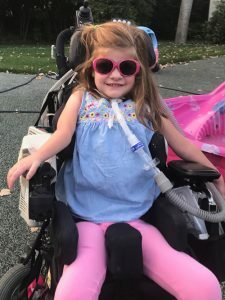 That was a huge step toward treating SMA. That vector is currently in Phase 2 clinical trials with AveXis/Novartis. Catherine and older sister Molly sporting festival face paint. “Dr. Shababi posted a paper, I believe in March 2016, that reported the results of her work on SMARD,” Sims says. “Lisa found the paper and contacted Dr. Shababi and had a wonderful reception. They had several very long conversations about what Monir was doing, what she had already been doing, and they immediately had a strong connection. “Dr. Shababi was very personable over the phone, and was very passionate and very approachable about her work,” Sims relates. “Sometimes, it’s hard to get ahold of people, but Monir answers her own phone, and she was very clear with Lisa about what had already been done, which was pretty cool for us because we didn’t know — we didn’t realize how much work Dr. Shababi and Dr. Lorson had already done on SMARD. We were impressed by how much of a handle they already had on the disease. They were ahead of the game. That was great news for us on the family side; at the time, we were aware of only one other lab in the country — the Jackson Lab in Maine — doing work in this area. We couldn’t believe that, wow, there’s a second lab and they are already in gear, they already have a lot of good things going. “If you look back a number of years, there has been a gene therapy on the translational side that has had exceptionally powerful results in SMA,” says Lorson. “AveXis now has a Phase 2 clinical trial going for their gene therapy product, which has the potential to be very impactful. It has demonstrated efficacy in SMA, but also provides an important proof of principle for gene therapy as a whole. So, it was really exciting to know that there’s only one gene responsible for each of these horribly devastating diseases, SMA and SMARD. It allows you to consider following a similar path. Knowing that, Monir started developing a project that was gene therapy, gene replacement for SMARD. “She was the first author on an important paper in Molecular Therapy published in 2016,” Lorson continues. “Based upon that, and the level of excitement, people found her. Through Facebook and Facebook friends, they started to communicate back and forth. Monir is driving it. Monir is doing it. “My in-laws have been very generous, but you need a lot of capital to do this research,” Jill Sims says. “SMARD is so rare that progress will probably come only from academic research. You really need a lot of support and you need a lot of funding from various sources. Right now, our life continues the same. It’s great that everybody is doing this great research, but you need so much more for a cure. That’s what everybody wants; we want our kids to be normal. “A day in the life of someone with SMARD is very difficult,” Sims says. “There’s a lot that has to be done to have a normal life, and there are a lot of obstacles to that, so you’re constantly trying to overcome those. “This disease is devastating,” Sims continues. “It can take away every basic human function: the ability to sit, crawl, stand, walk, talk, swallow, feed oneself, clean oneself, use writing utensils and so on. The disease also makes the person more likely to have respiratory problems since they can’t breathe or even cough on their own. It is hard as a parent. Every day we live with the potential fatality of this disease. If their trach tubes come out, they cannot breathe. These trachs sit in their windpipes, held in by ties, like a tight necklace. It is not secure. “You may go months without anything happening then, all of a sudden, it’s coming out. When that happens, she may only have 60 or so seconds to live,” Sims says. ”You have to have someone always watching them, either a specially trained nurse or a parent, who is a trained caregiver. “That’s the hard part that we always live with,” says Sims. “Yes, she looks good, and she goes to school, and she’s in activities, to some degree. We adapt everything so she can do as much as possible. But, she is living with a fatal disease that is non-treatable. We basically just manage her symptoms. We know very well that we could lose a second child. That’s what is hardest on us. Even though there are these great advances, she is alive because of amazing machines. Every day presents the chance that she could die. “When we take Catherine places, there are always at least 10 machines that go with her,” Sims says. “Everything just takes longer. We have a special van with a lift, because she’s in a wheelchair. You are in the thick of trying to make what is not normal to be normal. “You can’t just pick up your child and go, you can’t feed them a different way, or put a different outfit on them,” Sims continues. “Those are the silly things I took for granted having had a healthy child before. I just did her hair, brushed her teeth, and put her in whatever, and fed her whatever I wanted. Catherine cannot do that. It’s the small things that you take for granted, and there are so many ‘small’ things. We are fortunate to have excellent in-home nursing care, but this also means that my husband and I have had to sacrifice a lot of our privacy. And, I’ve had to give up a lot of my mothering, because I have someone else that always needs to know what I’m doing. That’s hard. “Our gene therapy vector is a very powerful tool,” Lorson says. “It is early days, in terms of trying to push it to the clinic, but we’re trying to do all the important pre-clinical questions. “There are a number of questions you have to ask,” Lorson continues. “When do you deliver that kind of vector? Does it work only if you do it right at birth, before disease develops? Can you correct the disease, in other words, once the research animals have the disease, can you bring them back to more of a normal state? Or, once that happens, is it just too late for something like gene therapy? We want to deliver what they want to see, in terms of working hard and getting results out. That is what we are trying to do. If you would like to help in the battle against diseases that could someday be relieved through gene therapy, please visit this page.